How close have you been to your favourite race car? Have you seen it race? Have you seen it demonstrated? How close did you get? Have you touched it? Have you sat in it? It's a shame it's blurry, but the photos below is the closest I ever got to a Lotus 49. The FOS in 2006 had most of GPL's cars on display, so it was a pretty dream-like event! I also got to meet a few heroes who've sadly left us, like Gurney, Brabham, Surtees. I believe I've seen the Lotus 49 race as well, back in 2001 at Brands Hatch. I think it may have been the Superprix. Another car I got to see for the first time just last week is the Toyota TS020 GT-One. Pretty much wet myself when I saw it in the flesh. Re: How close have you been to your favourite race car? I've sat in a 2002 Jordan, an early 1980's FFord, and a Venturi GT car. Seen a Lotus 25 in the flesh, at a museum. Of course, I was there when super touring peaked in Sweden around 1999-2001, so I saw those cars race in the flesh. Was 6 years old when I saw the Morgan Plus 8 race at the BPR round in Anderstorp in 1996. 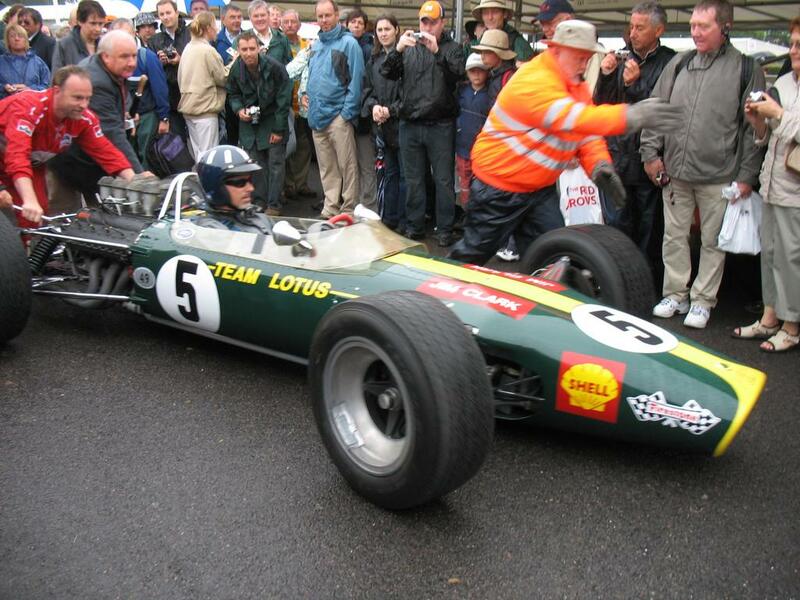 And I saw Jim Clark's Indy 500 winning Lotus 38 being towed behind a golf cart when I was at Indianapolis a few years ago (also saw it at the Goodwood Revival in 2013, being driven by Dario Franchitti, along with Kenny Bräck driving the Lotus turbine). But I've never even been close to a Panoz GTR1. ***Some say you should live each day like it was your last... but who wants to live each day in wild panic and extreme death anxiety? I've sat in one of Damon Hill's 1998 Jordan F1 cars, which for an 11 year one was absolutely incredible. I've also sat in a Jordan 191 and again it was incredible but I didn't really appreciate that as much because I was so new to F1 and had never seen that car before - ah the days before home internet where I had to rely on magazines or books to see old cars. Is that the car you could drive in Gran Turismo 2? What with Goodwood and the IMS museum, I've touched most of my favourite cars.